Celebrity Cruises operates nine cruise ships and three Xpedition Class ships offering worldwide itineraries including Alaska, Europe, Asia, South America, Caribbean, Panama Canal, Australia, New Zealand, Hawaii, and Galapagos. Celebrity Cruises has orders for four Edge-class ships to be delivered in 2018, 2020, 2021, and 2022. The ships will be 129,500 tons and will carry 2,900 passengers. Their first cruise was in 1990 and today they operate under the corporation Royal Caribbean Cruises Ltd. After merging in 1997 with Royal Caribbean International under the Royal Caribbean Cruises Ltd. (RCCL) umbrella, they have continued to grow their fleet to 10 elegant ships. 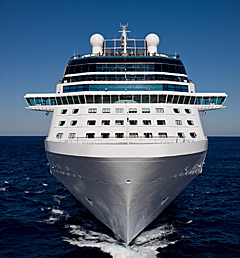 Another cruise line operated by RCCL is Azamara Club Cruises. RCCL also has joint ventures with investment groups that control the cruise lines Pullmantur, CDF, and TUI Cruises. In March 2016, Celebrity Cruises announced that they will expand its Celebrity Xpedition brand in the Galapagos Islands by acquiring Ocean Adventures, a small expedition line that owns the 48-passenger Eclipse and the 16-passenger Athala II. The vessels will enter drydock in January 2017 before joining the Celebrity fleet as Celebrity Xperience and Celebrity Xploration. Celebrity Cruises employs an international crew with a guest to staff ratio of nearly 2:1. They offer a more upscale product than its sister brand, Royal Caribbean International. Although primarily marketed to adult couples, their ships also feature children and teen facilities/programming. Celebrity Cruises is also the first Authorized Apple® Specialist at Sea. Passengers can purchase Apple technology duty-free and learn from the onboard iLounge Macologist. Celebrity Cruises’ employment web pages are laid out similar to Royal Caribbean International, providing details on how to apply for a job, current vacancies, and a list of authorized hiring partners. To apply online, click on the desired cruise ship job and you will be prompted to “Apply Online”. If the position you are interested in is not one of their current vacancies, Celebrity Cruises encourages applicants to use one of their authorized hiring partners.